At a certain point, getting very excited over new cereals goes from being a more-than-vaguely depressing concept to simply being one of the facts of life. Well, of my life, anyway. But with new cereals comes a wave of stress – it looks pretty good, but what if you buy it, and it isn’t? Then you’re stuck with an entire box of cereal, less the bowl you’ve already eaten. Unfortunately, even though it’s no good, throwing out food like that feels like a waste. So you leave the almost-full box of cereal in your cabinet, until it finally goes stale. Then you think, “Well, it’s stale now, I guess I should throw it out.” I’ve been there. So, as a public service to all of you, I have gone to great lengths to find the newest cereals, and let you know the straight scoop. I don’t know why I phrased it like that. That makes it seem like I’m making a pun on ice cream, which makes no sense. Full disclosure: by “great lengths”, I mean I saw endcaps at Walmart with all new cereals. Also, I didn’t get all of the new cereals I saw. Some didn’t look very good. So if you have complaints about the thoroughness of this, I probably won’t argue your point. 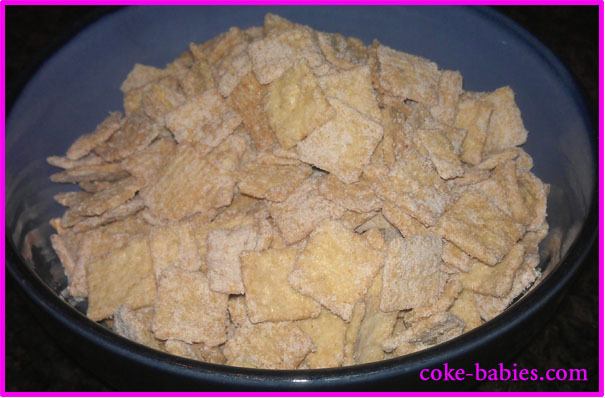 The first newcomer is an offshoot of Cinnamon Toast Crunch – Frosted Toast Crunch. I probably didn’t need to tell you that, as it’s very obvious. But I’ve got to get some facts in here somewhere, to balance out the ill-informed opinions that will surely be found elsewhere in this article. On paper, Frosted Toast Crunch sounds kind of disgusting. 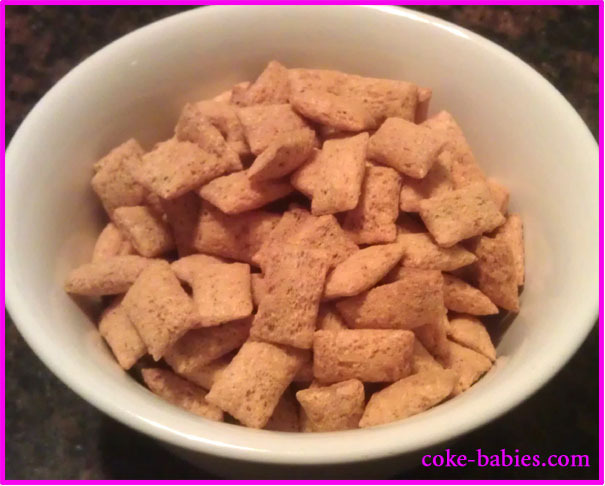 Cinnamon Toast Crunch is incredible, of course, but is already plenty sweet. The “frosted” description makes you think it is merely the cinnamon toast pieces with some sort of glaze on them. Thankfully, this is not the case. I won’t get into the science of it, but the actual cereal pieces themselves are frosted flavored, rather than physically frosted. Up to this point, I’m still not making a great case for them, I know. It just makes them sound like really, really sweet Cinnamon Toast Crunch. So I’m going to have to call in the big guns. 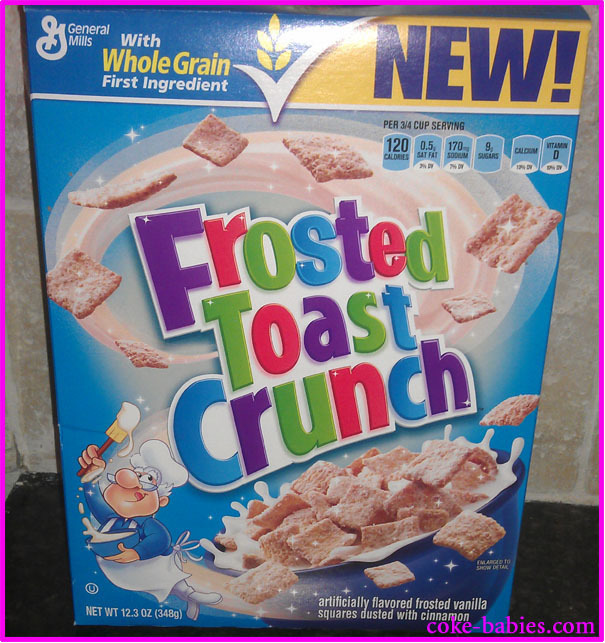 Frosted Toast Crunch tastes like a combination of Cinnamon Toast Crunch and Rice Krispies Treats Cereal. Boom. And despite the “frosted” adjective, and Rice Krispies Treats comparisons, the cereal itself surprisingly isn’t too sweet. No more than the standard Toast Crunch, anyway. The only downside to it is that it doesn’t give you as much of the dark cinnamon specks in the milk when it’s finished. Although I suppose when you need to cite that as a flaw, it’s a pretty successful attempt. 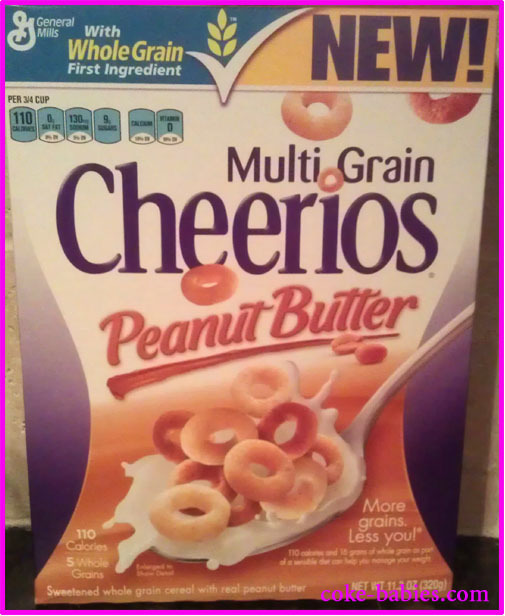 Before venturing into scary territory of brand new cereals, we will look at another offshoot – Peanut Butter Cheerios. All the various Cheerios are always better than you’d think. For such a dull original product, all of their spinoffs are almost always awesome. The only one I don’t like is Apple Cinnamon. Although to be fair, I think the last time I tried it was when I was 11, so it’s possible I may have grown to appreciate it. Besides the “Cheerios spinoff being promising” angle, the other potentially great thing about them is that there aren’t really any great peanut butter cereals. Of the major brands, Peanut Butter Crunch is ridiculously hard and painful to eat, Reese’s Puffs don’t taste that peanut buttery. All of the other peanut butter cereals are either discontinued or soon to be – Peanut Butter Toast Crunch, Pebbles Boulders, Bart Simpson Cereal, and Peanut Butter KISS Krunch. Your only other option is to venture into that weird section of the cereal aisle, where that Clifford cereal always is, to get some Puffins, Panda Puffs, or Leapin’ Lemurs (why are the “healthy” cereals all named after animals?). Given this peanut butter crisis, I was looking forward to Peanut Butter Cheerios. 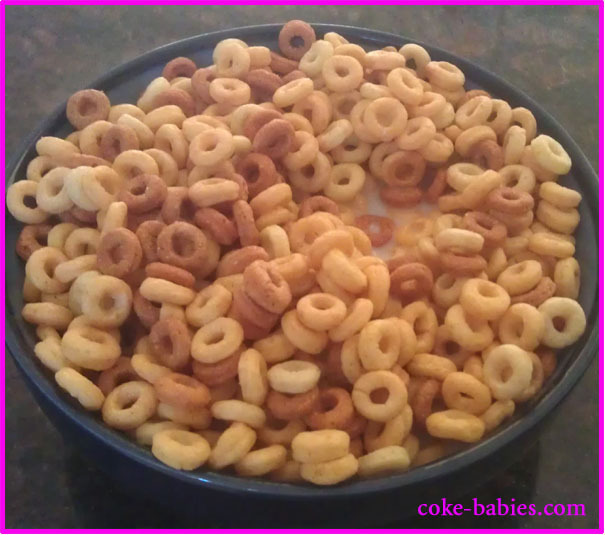 Especially since Chocolate Cheerios were surprisingly awesome. They make one of the best chocolate cereal milks out of any cereal around – look it up, they’ve done studies. It certainly isn’t the most visually appealing cereals out there. Just various shades of tan. They could have at least thrown in some artificially colored neon orange pieces in there, for the Reese’s vibe. Overall, Peanut Butter Cheerios are a big success, and give the Cap’n’s attempt a big curb stomp. I’m going to review the final two cereals separately, even though they are just two different flavors of the same cereal. But this way, I can say this roundup reviewed four cereals, which is one third more impressive sounding than three. 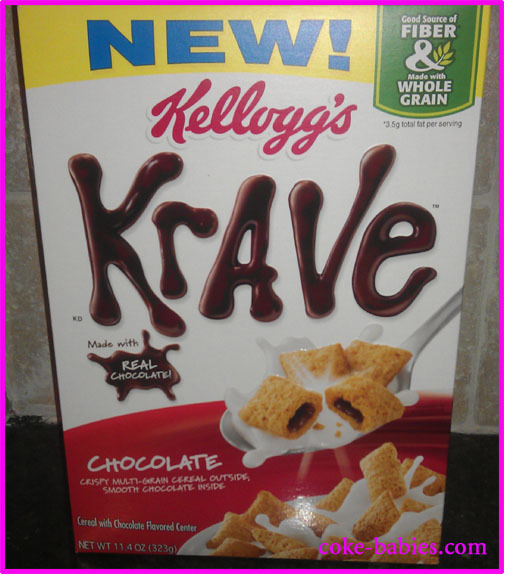 When I first saw the box for Krave, I thought it was some new Special K cereal. Something about the box has that “it’s not unhealthy and doesn’t taste that great, but we can pretend it’s an indulgence!” look to it. Like in that commercial where they try to tell you, “You don’t need that pint of delicious, rich chocolate ice cream – have this bowl of Special K with little chocolate pieces in it – it’s totally the same!” It just has that vibe of trying to trick you into thinking it’ll taste good. After looking a little more closely, it seemed it could have potential, but I just don’t like that box. The “chocolate” spelling out the logo is more than a little off-putting. And the rest either looks at best overly dietary, or at worst cheap. It was just a very conflicting package. It’s got cereal pieces practically oozing chocolate, yet talks about fiber. Although despite being next to the “Made with whole grain” claim, which tends to be mostly nonsense, it does have a legit amount of fiber per serving – 3 grams. Which is pretty impressive, considering that except for Mini-Wheats, most of the cereals I eat tend to have an asterisk next to the fiber count, meant to signify “not even enough to be one gram”. I wasn’t sure what to expect when it came to the cereal itself. With the slimy looking logo and chocolate pouring out of the the cereal pieces, I didn’t know if they were going for a “cereal version of Gushers”, or a chocolate pizza roll type of deal. Not surprisingly, and to be honest, thankfully, the chocolate did not ooze out like they imply. It’s just sort of there. But still good. I really like the texture of the cereal itself, mostly because it’s different than most of the other cereals out there. Due to both the cereal itself, and the fact that it’s sort of hollow, it has a strange-yet-good “soft” texture. Enough to not be mush, but soft enough where if you want, you can push it against the roof of your mouth to mash it up, instead of chewing. And, yes, this is my preferred method of eating it. The flavor itself is really good, sort of a deconstructed Cookie Crisp. Like I foreshadowed earlier, and you are no doubt overflowing with anticipation for, the milk results are nothing short of failure. Due to the “pocket” aspect of the cereal, none of the chocolate leaks into the milk. And the the cereal pieces themselves do basically nothing to the milk, either. 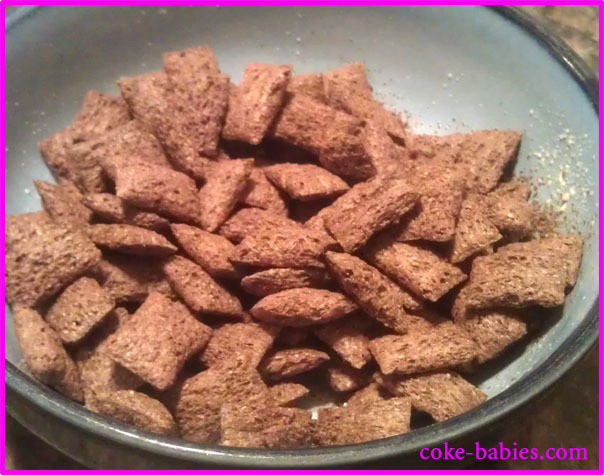 As a result, the milk at the end of this self-proclaimed “Chocolate” cereal results in nothing but plain milk! But, like I mentioned earlier, choosing your battles and all that. The cereal itself is good enough to somewhat overlook the disastrous milk. Double Chocolate Krave doesn’t require much of an introduction. It’s the same cereal we just went over, but the cereal itself is chocolate instead of, uh… “Plain?” I don’t know. Overall, I like Double Chocolate more. Because it’s more chocolate. I’m not sure how much more I can elaborate on that. I’m going with “not much”. Compared to Chocolate, Double Chocolate’s milk has, indeed, double the chocolate that Chocolate did. And by double, I mean that in the sense of “double of almost nothing still isn’t much”. The milk has to be the absolute least chocolatey I’ve ever seen, when it comes to a chocolate cereal. At least when you get to the bottom of the box, you can pour in all the crumbs and powder, and it will make it slightly better. 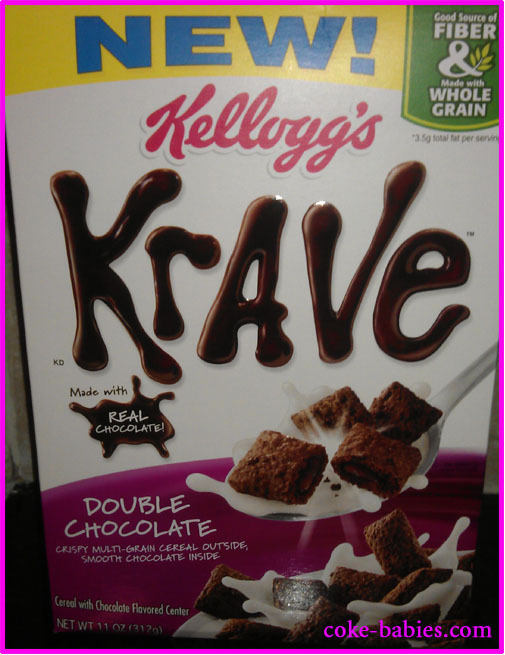 Like with regular Chocolate, Double Chocolate Krave is an awesome cereal that results in sub-sub-optimal milk. ProTip: Since the cereal isn’t very hard to begin with, you don’t need much milk. Therefore, using less milk means less sad milk at the end of the bowl. Or, if you’ve got a lot of milk left over, just throw some Quik in there or something. A successful round of cereals! All of them come highly recommended. And as soon as the next wave of fun and exciting new cereals come out, you can bet I will be there with the breaking updates. As soon as I get around to it.